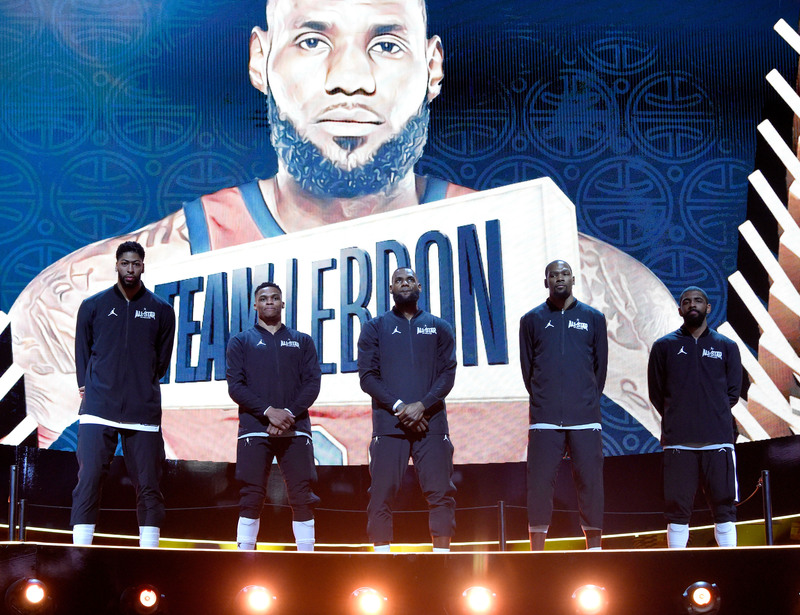 LeBron James won All-Star Game MVP this weekend. The last time he won it was 10 years ago, which is another testament to his longstanding dominance. LeBron James dominated All-Star Weekend in his 15th season, dropping knowledge off the court and taking home hardware at the big game. 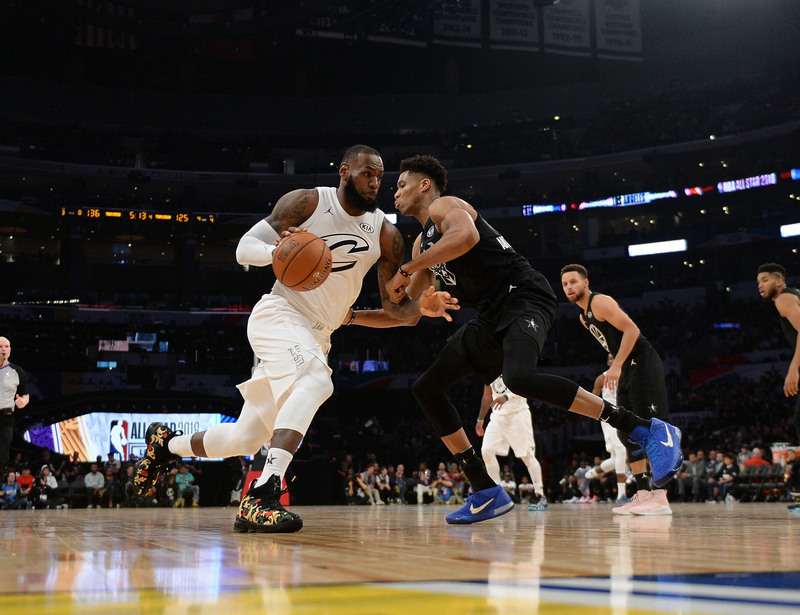 After a long weekend in Los Angeles, Andrew Sharp and Ben Golliver gathered on the latest episode of the Open Floor podcast to discuss the improved All-Star Game, LeBron's latest milestone and Stephen Curry's voting process. Ben Golliver: We had some pretty extended, ongoing debates about the All-Star teams, Team LeBron, Team Steph and we all saw what happened on the court tonight. So do you want to run down what happened? Or maybe I should do that? Andrew Sharp: You're patting yourself on the back. You're congratulating yourself for your class, and I almost responded to somebody on Twitter who was wondering why you weren't gloating more. And I said, 'Look, Ben is a follower of the Spurs' way. It's not in his nature to gloat.' But I want you to know that I'm also taking the high road here. If we're really breaking down the game, if we really want to take it seriously, Team Steph was by far the superior squad but for one detail. Did you happen to notice James Harden's entry in the box score? Golliver: You're not going to do this. You're not going to pin the whole thing on Harden. First of all, you said the best GM was Steph. He picked this underrated, amazing roster full of three-point shooters, and for a decent amount of the game that looked like the way it was going to go. Unfortunately, team-wide collapse in the fourth quarter, Steph Curry nowhere to be found, and I think really what you saw was talent winning out, right? The two best players in the league, Kevin Durant and LeBron James, they just took over and they got serious. And on the crucial possession of the game, Stephen curry got lost like a 4-year-old in a sleeping bag. He had no daylight, he didn't know where he was, he couldn't get a shot off. As Kevin Durant said, it spoiled their whole possession. They couldn't even bail out to a guy in the corner. So right now what I'm saying is you can't scapegoat James Harden in this situation, because not only did Curry pick Harden for his team, but he was also the guy with the ball in his hands with the game in his hands. Sharp: On the last possession, Stephen Curry, the second-best player in the world, was blanketed by the best player in the world, LeBron James, and the third-best player in the world, Kevin Durant. I'm not going to kill him too much for failing to get a shot off. I will grant you that Steph's greatest mistake was putting his faith in Harden, and I have good friends of mind who have made the same mistake in the past year. So I can't really blame him, I don't want to crush him for that. But 5-of-19, 2-of-13 from three-point, it was a rough night for our guy James Harden. Golliver: I think you're doing too much. You're doing way too much here. Let's give credit where it's due. LeBron was sensational down the stretch when he wanted to be. When they come out and they have that quick bang-bang-bang pass play with all the motion to set up the hoop for him, that was awesome. The rolling back to his left three-pointer than you still don't want him to shoot because he's not that good of a three-pointer shooter, and yet when he needs to hit that deep look over Embiid he drains it. On the clutch possession, I was right there with him. I was in the huddle saying foul up three like the biggest nerd of all-time at an All-Star Game. And LeBron said trust that we can get a stop. LeBron is a thinker, he knew Curry's tendency, he knew Curry was going to want to over dribble and try to find a window to get a shot off and LeBron and Durant were right there to shut him down when they needed to. From that standpoint, as a backer of Team LeBron, it's just really nice to be on this side of the result. Sharp: You make an interesting point, because I was watching and thinking the exact same thing. The All-Star Game is more competitive than it's been in years, and we'll really know it's real if they start intentional fouling down the stretch, and we were very, very close. So apart from our internal bickering and our ongoing feud, I had a lot of fun watch that game. I'm not sure how it translated on television, and I haven't checked Twitter reactions, but I really feel like the new format and whatever changed worked—whether it was putting up money for the players, whether it was putting pride on the line for someone like LeBron, who looked like he really set the tone for everybody. This was a lot more fun than I expected, and that's partly because I came in with rock-bottom expectations, but I think it's a win for the league. Sharp: That was the funniest part, because people adjusted on defense but no one really adjusted the offense. They were still trying to throw passes off the backboard and do all the crazy All-Star s--- they always did. But everybody kind of fell into a rhythm after that first quarter, and my No. 1 takeaway was that I was blown away by LeBron still doing this at 33 years old. And in basketball years, he's probably like 35 or 36 because he's paying nine months per year every single season. A guy is not supposed to be on the throne for this long, and he should've passed the torch to someone like KD and Steph is in the mix and Giannis is coming up. Next to all those guys, LeBron was on another level the entire time. Golliver: Couple thoughts: First of all, his third MVP at the All-Star Game, he's now one of six players to get three. The amazing stat backing up what you just said—it's been a decade since he won his last one. And I was spending a good portion of the second quarter trying to figure out how many guys have won All-Star MVP at an older age than LeBron. I came up with Shaquille O'Neal when he got that fake shared MVP with Kobe Bryant and then I came up with Michael Jordan. I don't know if there are others. It's a very short list already, and LeBron could have another MVP in him three years down the line. The second thing you said, it's a win in general because of how exciting this game is compared to previous games. Couple statistical notes for perspective here: This year there were 293 points scored. That is down from 374 last year. So we're talking about basically 81 points fewer than last year in a one-year correction, so clearly something changed. And I think there's a debate about what changed, though. Was it the money like you said, was it mixing up the teams so the Western Conference's more talented roster was spread out, forcing the game to be tighter, or was it the players kind of looking themselves in the mirror and realizing that things have gotten completely out of hand. Personally, I believe it was the last one, and you heard Dwane Casey allude to it. They wanted to change the narrative that no one cares about the All-Star Game, you heard KD repeat that mantra, you heard LeBron say something along those lines. I think that's a complicated way of saying, 'Look, we got sick of how ugly the All-Star Game was these last couple years, we just decided to play hard again. And I put up a tweet if people want to look at it in terms of how many points have been scored in the last 10 All-Star Games, and what you see is it really was basically a two-year blip. Basically Toronto and New Orleans were out of control. Everyone decided not to try at all those two years. The rest of them were more reasonable. I think for whatever reason, they had the right powwow. Everybody decided to have pride against this year for the first after basically taking the last two off, and that was the difference.